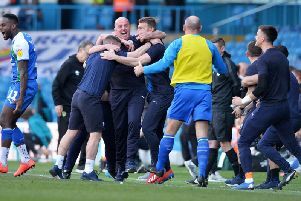 Jay Whittle looks at the social media reaction after Wigan Athletic were denied from recording their second league victory of the season against Nottingham Forest. Latics looked set to be heading towards their second win of the 2018-19 campaign, however Nottingham Forest scored a late leveller to devastate Paul Cook’s side and split the spoils at the DW Stadium. Wigan had a dream start after Nick Powell nodded home from Lee Evans’ corner to give Latics the lead with just two minutes on the clock, before Matty Cash equalised for the visitors eight minutes later. Latics regained the lead in the 30th minute from the spot, with Will Grigg calmly dispatching the penalty that he won after being dragged down in the area by Ben Osborn awaiting Antonee Robinson’s cross. Grigg made it a half century of Football League goals in Latics’ colours, putting him within just 21 goals from becoming Wigan Athletic’s all-time top goal-scorer. Wigan defended well to sustain their lead for the remaining hour of the encounter, before slipping up in the dying seconds to hand Forest, a crucial but undeserved point. Matty Cash was adjudged to be felled in the area by Latics skipper Sam Morsy when cutting inside from the left-wing in the 90th minute. Lewis Grabban’s spot-kick was saved by Christian Walton, however Hillal Soudani was the quickest to bundle the ball home on the rebound to bail Nottingham Forest out of jail and extend their unbeaten run to five games in all competitions. It was a killer blow for Paul Cook’s side, with Wigan’s impressive performance more than meriting all three points on Saturday afternoon. Nottingham Forest fans also had their say on social media- with fans stating that they were lucky to leave the DW Stadium with a point, and also tipping that Latics can surprise a few teams this season.